I just love silly putty! I buy it and sell it all the time. I have color changing putty, gold putty, and glow putty. Come see what I have to sell on eBay! 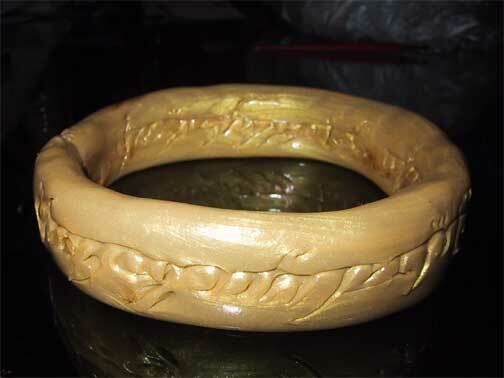 Lord of the Rings - the One Ring rendered in Gold Putty! My inventory of putty. I thought I had over a hundred pounds... looks like I've only got about 75 pounds. Sob! Persistence of Putty - How I created Dali's "Persistence of Vision" rendered in Putty! and won Crazy Aaron's putty sculpture contest! http://www.sunbelt-software.com/stu/putty/ - What happens when a 50 pound ball of silly putty is dropped from 5 stories up? These people had the courage to find out. http://www.vern.com/putty/ - One stop shop to see putty creations, fun facts, links. You can even join a mailing list for fellow putty fanatics where we collaborate to buy pools of putty and powder dye (including glow powder, WOW! ), and talk about various (mis)uses of putty and it's environs.